A University of Wisconsin-Green Bay junior credited with helping to significantly increase student attendance at home athletics events has been named the University’s Student Employee of the Year, part of a weeklong recognition of student employees and their role on campus. Communication major Logan Hendricks is the Student Marketing and Promotions Coordinator, a position he has held for nearly three years. Hendricks received the student employee accolade in part because he was the driving force behind the new Phoenix Phanatics rewards program aimed at increasing student attendance at home athletic events. Under the program, many sporting events experienced a significant increase in attendance — some as much as 200 percent. Hendricks has the ability to take on new projects and develop new ways of approaching tasks, and always demonstrates professionalism in his work and personality, according to Athletics Marketing and Promotions Coordinator Adam Halfmann, who nominated Hendricks. 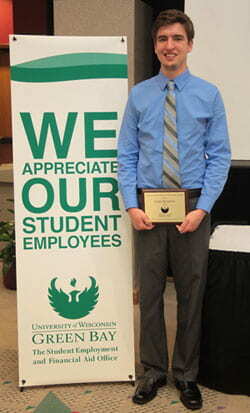 Hendricks, a De Pere High School graduate, received a $50 gift card and a UW-Green Bay Student Employee of the Year engraved plaque during a ceremony held Monday, April 16 on campus. His name was engraved on a plaque that will hang in the Financial Aid and Student Employment Office, and a photo will be displayed for the next year at the Kress Events Center. Student Employee Appreciation Week continues through Friday, April 20, with games and giveaways being held on campus. More information about the campus and national student employee recognition activities is available online at www.uwgb.edu/financialaid/employment/seoty/appreciation.asp and www.nsea.info/docs/about/awards/seotyaward.html/. This entry was posted in Announcements, News, News Releases and tagged achievements, Financial Aid, student employee appreciation week, Student Employee of the Year, student employment on April 17, 2012 by Kelly Moore.